INTI College Sarawak is introducing a new programme designed to boost students’ employability prospects and career advancement in the field of business. The 2-year Diploma in Business is tailored to meet the needs of industry in disciplines ranging from management, marketing, and accounting to soft skills. “One of the highlights of the programme is a Capstone module which exposes students to real life business situations. With the support and guidance of our dedicated and experienced team of lecturers, they will be able to draw on what they have learnt and develop critical thinking skills as they formulate business solutions for various scenarios,” said Ivy Lau, Chief Executive and Principal of INTI College Sarawak. 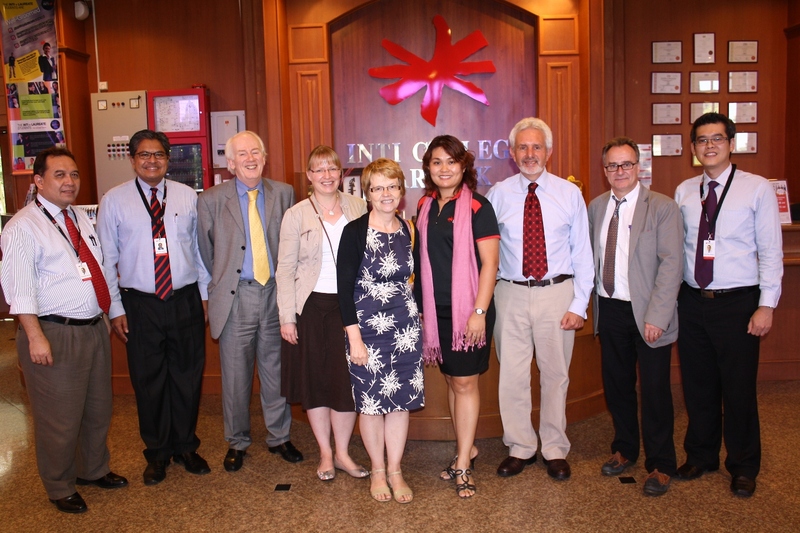 Ivy Lau (4th from right) and INTI’s academic team members with visiting academics from the University of Hertfordshire. Upon completion of the programme, students can pursue careers in banking, business development, finance, human resource, marketing and other areas. They can also opt for degree studies in business, including the Bachelor of Arts (Hons) in Business Administration programme which INTI offers in collaboration with the University of Hertfordshire (UH), an award-winning entrepreneurial university in the UK and one of the world’s top 100 universities aged under 50 in Times Higher Education’s World University Rankings portfolio. The Bachelor of Arts (Hons) in Business Administration has been the programme of choice for learners seeking a degree that offers valuable insights into real-world business management. As the entire degree can be completed at INTI College Sarawak, students have the opportunity to earn a prestigious internationally recognized qualification without having to incur the high cost of tuition and living expenses usually associated with tertiary level studies abroad. Working adults and STPM holders who wish to pursue the qualification while embarking on a career can opt to join the specially-tailored evening classes. “Evening classes give working adults added flexibility which is essential in managing their careers and achieving a balanced approach in life. Learners will develop the ability to plan, organize, lead and control work teams. All important areas of a business organization are covered in the programme so as to produce well-informed and farsighted business professionals. The programme is accredited by the Malaysian Qualifications Agency (MQA) and recognized by the Public Service Department (JPA),” said Lau. Enrolment for the Diploma in Business and the Bachelor of Arts (Hons) in Business Administration programmes is now open and classes will commence on 22 August 2012. Students who have completed SPM with a minimum of 3 credits are eligible for the diploma programme while those who have completed A Level or STPM with 2 principal passes or have achieved 5 Bs in UEC, or completed accredited Foundation in Business programmes are eligible for the degree programme. Those with a relevant MQA-accredited diploma can progress to Year 2 of the degree programme. For further information, please call 082-570888 or visit INTI College Sarawak at Jalan Stampin Timur in Kuching.